LG is a South Korean multinational company, which manufactures electronic gadgets and devices, telecommunication devices etc. LG recently received Global Mobile Award in 2014 for its innovative manufacturing. 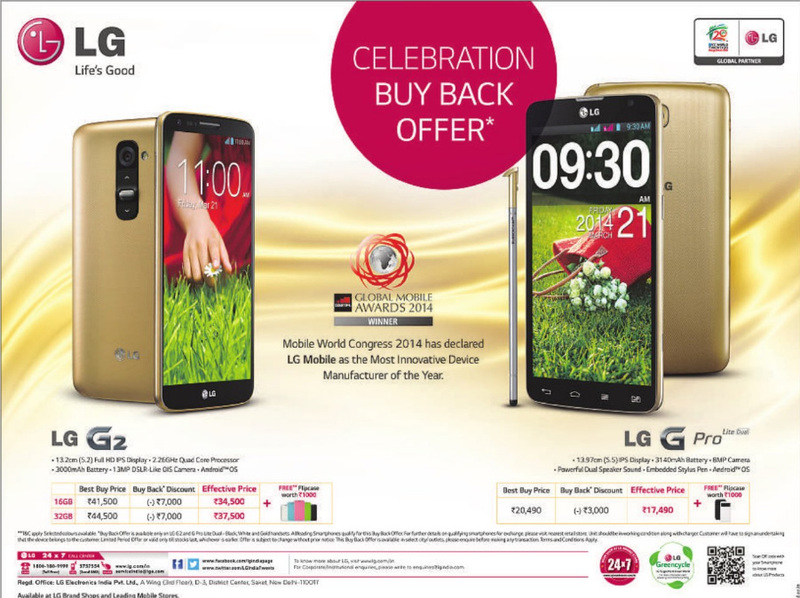 Now LG comes to celebrate its winning with you by offering buy back deals. Enjoy LG’s innovative gadgets with Buy Back offer, which is offering exciting exchange schemes on G2 and G Pro smartphones, which were launched at Mobile World Congress in Barcelona and made LG proud with the tag of most innovative device manufacturer of the year. LG G2 with 5.2 HD IPS display and 2.26GHz quad core processor are available in 16GB and 32GB variants with best buy price. LG is also offering best buy price on G Pro smartphones which is quite stylish with 5.5 IPS display, stylus pen and powerful dual speakers. It is also providing free back cover worth Rs. 1000. For more details check the banner which will furnish you with each and every details regarding the same.